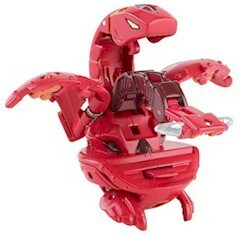 Snapzoid is a snake-like Bakugan. In Bakugan form, it resembles a snake with a dragon's head. It slightly resembles Serpenoid or Rattleoid. Inside it's mouth, it has a another head. It's first appearance in the anime was in New Vestroia episode 52. There are currently no Haos versions released. Its Subterra version comes in only one variation, with 720 Gs in BakuBoost. Its Aquos version comes in three variations, with 660 Gs in BakuTriad, 780 Gs in BakuBoost, and one with 820 Gs. Its Pyrus version comes in one variation, with 730 Gs in BakuBoost and BakuTriad. Its Ventus version comes in one variation, with 680 Gs in BakuBoost. Its Darkus version has 770 Gs. Purchase your Season 3 Snapzoid Bakugan from Amazon now!